The Damned have announced they’ll release their first album in 10 years on April 13. The follow-up to 2008’s So, Who’s Paranoid? will be titled Evil Spirits and launch via Search And Destroy/Spinefarm Records. 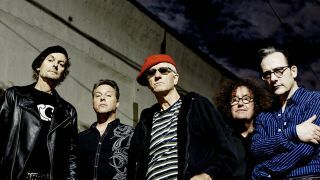 Guitarist Captain Sensible says of the Tony Visconti-produced album: “We deliberately recorded the album retro style. The same way our debut album was made, basically. “There’s something wonderful about the 70s sounds – glam, rock and punk records, they all sound so great and Tony specialises in beautifully crafted old school production. To mark the album announcement, The Damned have also released the single Standing On The Edge Of Tomorrow. Frontman Dave Vanian calls the track “very optimistic, even though it’s about a dark subject” and adds: “As an artist, you can’t help but reflect the times, because that’s what art does. I think we always do it, but in a slightly different way. “So a song like Standing On The Edge Of Tomorrow may seem quite joyous and uplifting musically, but some of the lyrics might be about quite dark things. The Damned will head out on a 17-date UK tour later this week. Find the dates below, along with the Evil Spirits tracklist and cover art.